Hello and happy #FunMealFriday! This week, we'll be making Quertie. This fun meal gets it's name from the antioxidant quercetin. Quercetin is an antioxidant that helps our lungs stay strong. Let's get started! That's it! Super easy and so yummy! If you made this week's #FunMealFriday, be sure to share it with the hashtag! Until next week! Hello and happy #FunMealFriday! This week, we'll be making Mega Mix! This fun meal gets it's name from the Omega 3s that chia seeds give our bodies. Omega 3s helps our brain remember all the fun things that we learn. Let's get started! 1. Add your chia seeds to your coconut milk and allow them to soak for at least 5 minutes. 2. Mash your bananas together to a nice paste like consistency. Add your vanilla extract and chia seed mix. 3. Stir together with your berries and enjoy! Hello and happy #FunMealFriday! This week, we'll be making Ceaches! This fun meal gets it's name from the vitamin C that peaches gives our bodies. Vitamin C helps keep our skin feeling strong. Let's get started! 1. Cut your peach in half and remove the pit. Scoop out a little extra to make room for the yummy filling. 2. To make the filling, place your banana, date, vanilla powder and lemon juice in a blender and blend into a paste. 3. Place your filling in the peach and enjoy! Hello and happy #FunMealFriday! This week, we'll be making Sunny Pucker Salad. This fun meal gets it's name from the tangy taste that it has. Apart of this tang comes from the apple cider vinegar that it includes. Apple cider vinegar helps our body to absorb vitamins that make us strong. Let's get started! 1. Chop and mix your tomato, carrot and leafy greens in a big bowl! 2. In another dish, mix you dressing ingredients. 3. Drizzle your dressing on top to your liking and enjoy! That's it! So easy and so yummy! If you made this week's #FunMealFriday, be sure to share it with the hashtag! Until next week! Happy #FunMealFriday and happy new year! This week, we made Berberry Salad. This treat gets it's name from the fiber that berries give us. Fiber helps our body to feel full and gives us energy to play. So let's get started! 1. Cut up all your berries and mix together in a bowl. 2. Squeeze the juice from a lemon on top. 3. Drizzle the honey in an mix. That's it! So easy and SO yummy! If you make this week's #FunMealFriday, be sure to share with the hashtag! Until next week! Hello and happy #FunMealFriday! This week, we'll be making Calcoa! This drink gets it's name from the calcium that the cocoa will give us in this yummy drink. Calcium makes our bones strong! Let's get started! 1. Combine all of your ingredients in a blender and blend. This will give a bit of warmth to your drink without killing the nutrients. We hope you enjoy the holidays and this special treat. If you try this #FunMealFriday, be sure to share with the hashtag. Until next week! Hello and happy #FunMealFriday! To keep fighting cold and flu season, we'll be making Flamsicles! This treat is Anti-inflammatory because of turmeric it contains. Anti-Inflammatory foods help our bodies calm down from fighting cold and flu . Let's get started! * This recipe also requires some other supplies! If you have a popsicle mold, feel free to use that. If not, you can make the recipe with small cups/ containers and craft sticks. 1. Combine all of your ingredients in a cup and stir. 2. Pour your mixture into your mold. 3. Place the stick/stem in the mixture and make sure it secure. Place the pops in the freezer and allow to freeze for 4 hours. 4. Remove from the freezer and enjoy! So yummy and so helpful! If you enjoyed this #FunMealFriday, please share your pictures with us in the hashtag! Until next week! Hello and Happy #FunMealFriday! As the seasons are changing, are bodies are a little more sensitive to picking up colds. This Fun Meal Friday, we'll be making Alkalader. This drink gets it's name from it's name from the alkalizing abilities. Drinking this alkalizing drink makes it much harder for germs to live in our bodies. So let's get started! 1. Warm your cup of water on the stove to your liking. Cut your lemon into fourths and add it in as it warms up. 2. Once it warms up, add your tablespoons of apple cider vinegar and honey. Stir and enjoy! That's all! This drink is nice and tangy and will keep your body healthy! If you make this week's fun meal, be sure to share your pictures with the hashtag! Until next week! Hello! Happy #FunMealFriday! This week, we'll be making a delicious dish called Polyado! 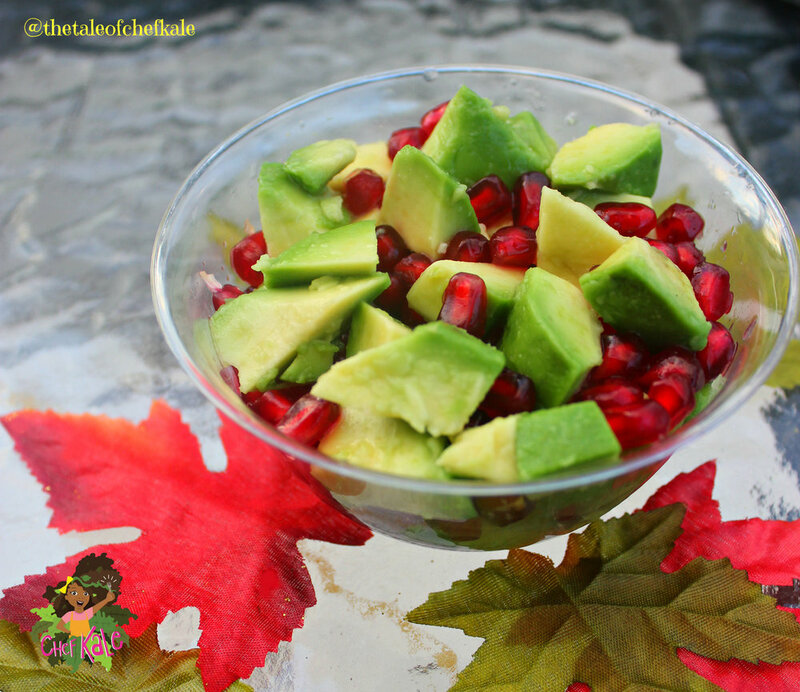 This dish gets it's name from the polyphenols that pomegranate gives our bodies. Polyphenols are an antioxidant that help our bodies stay healthy and strong for a long time. Let's get started! 1. Cut your avocado in half removing the seed and skin. Dice it into cubes. Place in a bowl. 2. Cut your pomegranate in half removing the seeds (or arils, their real name.) Add them in with your avocado cubes. 3. Squeeze the juice from your lemon on the top of the mixture. Stir and enjoy! Hope you enjoyed this #funmealfriday! When you make it, be sure to share it with us with the hashtag! Until next week! Hey there! Happy #FunMealFriday! This week, we'll be making Ayie! This smoothie gets it's name from the Vitamin A that it gives our bodies. Vitamin A is great for keeping are eye sight strong. Let's get started! 1. Combine all the ingredients in a blender and blend. That's it! Super easy and really delicious. If you make this fun meal, please share with the hashtag. Until next week! Hello and happy Fun Meal Friday! This week, we will be making Zilli! This meal gets it's name from the Zinc that it gives our body. Zinc is a wonderful vitamin to help our bodies fight colds. Let's get started! 1. Blend your soaked sun-dried tomatoes with your diced tomatoes. 2. Mix in the rest of your ingredients. Wasn't that easy?! And super yummy too. I hope you enjoy! If you make this week's Fun Meal Friday, be sure to share it with the hashtag. Until next week! Happy #FunMealFriday! This week, we'll be making Ace Bowls! Ace Bowls get the name from the way that Vitamin A, C and E that it gives our bodies. These vitamins are so helpful in keeping our skin strong! Let's get started! 1. Combine 1 1/2 of your chopped apples, banana and a water in a blender and blend until smooth. 2. Pour your mixture into a bowl. 3. Mix in your sunflower kernels. Place your extra chopped apple pieces, cinnamon, and coconut shreds on top to your liking. Feel free to add whatever other yummy toppings you can think of! That's it! I hope you enjoy! If you make this week's Fun Meal Friday, be sure to share with the hashtag! Until next week! Happy Fun Meal Friday! This week's recipe is one we enjoyed at our United Solo Theater Festival performance! It's called Ceesghetti, and it gets the name from the vitamin C that zucchini gives us. Vitamin C helps us to feel happy, keeps us strong, and is great for our skin. Let's get started! 1. This fun meal involves a spiralizer! Place your zucchini in the spiralizer on the smallest setting and wind out yummy zucchini noodles. 2. Combine your both tomatoes, garlic, Italian herbs, basil, cilantro, and nutritional yeast in a blender or food processor. Be sure to add as much or as little you like of these ingredients. If you really enjoy sauce, you may want to use more tomatoes. Squeeze juice from the lime on top to add a yummy zest. Blend them up! 3. Add your blended sauce on top of your zucchini. Enjoy! That's all! Easy as 1 2 3 and so yummy! If you make this week's fun meal, be sure to share it with #funmealfriday! Until next week! Happy Fun Meal Friday! This week, we'll be making a Patassiox Smoothie. This yummy treat gets it's name from the potassium and vitamin A that pumpkins give us and the antioxidants that we give from cinnamon. Let's get started! 1. Combine the ingredients into a blender and blend until smooth. 2. Pour into a glass. For fun, you can add cinnamon or chia seeds on top! That's it! Very easy and very yummy. If you make this week's fun meal Friday, share it with #funmealfriday! Until next week! Happy Fun Meal Friday! This week we'll be making bee bees! This fun little snack gets it's name from vitamin b and vitamin e, two wonderful vitamins to give our bodies the fuel they need to keep playing. Let's get started! 1. Combine all of our ingredients into a food processor or blender and blend until products are a soil like texture. 2. Take out the mixture and place on a cutting board. 3. Mold the mixture into whatever shapes you like! I made circles, but you can use cookie cutters or your hands to mold anything! Sprinkle some extra coconut on top to taste. That's all! I hope you enjoy some bee bees this weekend! If you do, please share your pictures with the #funmealfriday! Until next week! Fun Meal Friday: Mono Meal! The freckles on this banana tells us that they're ripe and ready for digestion! This Fun Meal Friday maybe the easiest one to make yet! Let's get started! Eating the same fruit for a meal is called a mono meal and it has many health benefits. Along with being very easy for you to make, mono meals are easy for your body to digest. Because you are only eating one type of food at a time, your body won't have to so as much to breakdown the food for nutrients. Having mono meals also help figure out when you're truly hungry. While eating only one type of fruit, your attention focuses a bit more on what you're doing. When your body is full, your taste buds will give you a signal by shifting the taste of the fruit, making it a little less enjoyable. Mono meals also allow you to get very creative! The meal below is made completely of bananas! Are you going to try a mono meal this weekend?! We'd love to see! Share your pictures with #funmealfriday. Until next week! This week we'll be making Bopperum Nests! This dish gets its name from the the vitamin B it give our bodies for energy, copper for our blood, and magnesium for our and bones. Let's get started! 1. Cut the top of the tomato off and scoop out the insides. Make sure you save the top! 2. Cut your avocado and scoop out the insides. Mash them to a mushy texture. 3. Chop up your green onions and celery into itty bitty bites. Add them to your avocado mash. 4. Half your lemon and squeeze juice over your avocado mix. Add the top back to your nest! Hope you enjoy this yummy dish! If you make this Fun Meal Friday, please share your pictures with us with the hashtag #funmealfriday! Until next week! Fun Meal Friday: Fobertene Tacos! This week we'll be making Fobertene Tacos! This yummy treat is packed with so many benefits to keep your body healthy and happy. The name Fobertene comes from folate, which is great for you heart, fiber which is super helpful for the tummy, and beta carotene to keep your peepers doing their best peeping! Let's get started! Feel free to use as much or as little as you want and even feel free to add some of your other favorite ingredients! 1. Separate your desired amount of Romaine leaves. Feel free to half the leaves to make it easier for tiny hands to pick up. 2. Chop up your veggies into small, bite pieces. You can place them in bowls for your little ones to pick and choose their favorites. 3. Add your chopped veggies into to your romaine leaf. Squeeze lemon juice on top and sprinkle cilantro to your taste. Pretty easy, right! And so yummy. If you make Fobertene Tacos, please share your pictures with #kalefunmealfriday! Hope you enjoy! This week we will be making a Kaoxie Sundae! This treat gets it's name for all the Vitamin K that keeps our blood flowing and antioxidants to keep our body strong! Here's how we make it! 2. Get 3 cups. This will store the different layers of Kaoxie Sundae. 3. Blend your first layer; 2 frozen bananas, 2 non-frozen bananas, your blueberries and a tablespoon of water. Place in your cup. 4. Blend your second layer; 1 frozen banana, 1 non-frozen banana and a tablespoon of water. Place that in your second cup. 5. Blend your third layer; 1 frozen banana, 1 non-frozen banana, tablespoon of water and about a handful of spinach. Add it to your third cup. 6. Now for the fun part! Add a layer from each cup into a glass. You can have fun making the layers of your Kaoxie Sundae as thick or thin as you like. And that's all folks! Hope you enjoy! If you make a Kaoxie Sundae this weekend, please share a picture with by #KaleFunMealFriday. Until next week! We are so excited to share our very first Fun Meal Friday! Weekly, we'll be bringing you a fun recipe that the whole family can enjoy. This week, we'll be making Armonchies! This silly name tells us what special way this treat will help our bodies. Armonchies will give our bodies fiber to help our hearts and iron to keep our blood moving! Now here's how we make it! 2. Lay your apple down horizontally and slice. Feel free to keep your layers as thin or thick as you want. That makes it more fun to stack! Once you're finished, stack your apple back up vertically and wait for the next ingredient. 3.Place your dates in a blender or food processor with a teeny tiny bit of water. Blend until you create a paste like consistency. Place in a container to get the blender or food processor ready up for your next step. 4. Place mulberries and vanilla powder in the blender and pulse to make a thick powder. 5. Spread your date paste in between each layer of your apple, adding a sprinkle of powder on top of the paste before each layer. 6. (And most important) ENJOY! Feel free to double or triple this recipe so that everyone can enjoy! Until next week!